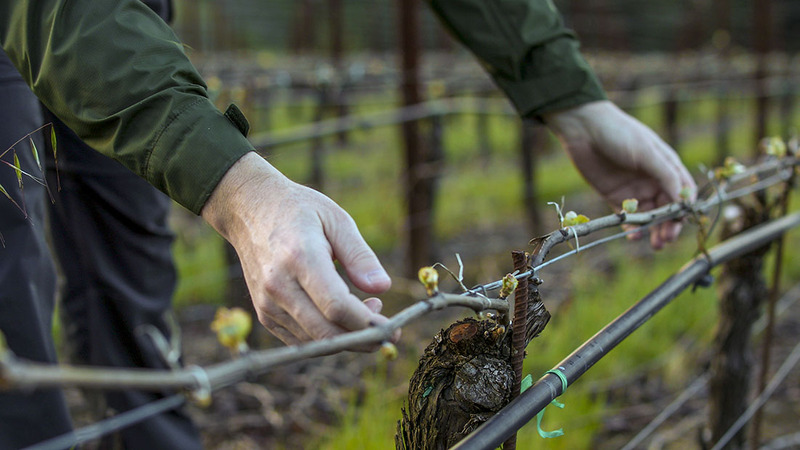 In 1964, the magical Montecillo Vineyard was planted at 1,700 feet on the steep slope of Moon Mountain, a stone’s throw across the Napa–Sonoma border, on the western side of Mount Veeder. Its highly eroded iron-rich red soils yield wines of unmistakable pedigree: distinct, powerful, complex flavors that can only be achieved in this rugged place—a pure, natural translation of gnarly old vines on the rockiest soils imaginable. Our 2016 bottling is among the most texturally layered examples this vineyard has produced—soft, broad and chewy with a fine interplay of naturally wild site elements and powerful vintage-driven fruit notes. Deep, penetrating aromas of black plum, cassis, olive tapenade and dusty stone merge with Provençal herbal complexity. A lingering lift of red fruit and sea spray add freshness. The full, rich entry is immediately plush and layered with a broad, mouth-coating texture. Incredible dark chocolate flavors meld with blackcurrant and smoky pine, framed by dense tannins. Subtle, savory notes emerge as the forward youthful fruit fades and the wine finishes with mint, earth and smoke complexity. Drink from late 2018 through 2024.